Since the first autopsy description of a foramen magnum (FM) meningioma was presented by Hallopeau  in 1872, it has been appreciated that lesions in this region may present many challenges to a surgeon attempting resection. FM tumors are located in an anatomically complex region surrounded by bony elements of the craniocervical junction, the vertebrobasilar system of vessels, the lower cranial nerves, and by delicate brainstem neural elements. Since the first successful FM meningioma resection in 1922 was reported by Frazier and Spiller,  a number of surgical refinements have been introduced to aid in the management of these technically demanding lesions. The use of microneurosurgical techniques with modern skull base approaches now allows for definitive surgical management with an acceptable risk profile in most cases. Expanded endoscopic endonasal approaches are also now being performed in attempt to further minimize surgical morbidity in removing these lesions. However, in those cases where definitive surgical management cannot be performed due to age, medical condition, or patient preference, radiosurgery is also a viable option and has been utilized with some success. Lesions of the posterior or posterolateral foramen magnum are classically reached via posterior midline or retrosigmoid approaches. The original surgical approaches to anterior or anterolateral FM lesions were also through the posterior midline; however, this approach requires significant brainstem retraction and reports of high morbidity and mortality prevented its widespread acceptance. , Neurosurgeons then explored alternate anterior approaches such as the transoral route. These cases, however, were plagued by cerebrospinal fluid (CSF) leaks and infections, craniocervical instability, and incomplete resections for tumors extending laterally. , The main advantage of the transoral approach was its direct route to the FM lesion. Developed along the same line of thought, the endoscopic endonasal approach has recently emerged as a modern approach to midline cranial base lesions, including those in the anterior foramen magnum and offers the possibility of reduced morbidity as compared to open approaches. The typical open approaches currently in use represent a lateral extension of the posterior midline approach and include the far lateral,  and extreme lateral approaches. The posterior midline approach has also recently been resurrected as a possibility for these lesions. Here we present a detailed review of the literature on the management of FM lesions, whether approached via one of these surgical approaches or treated with radiosurgery. The epidemiology, clinical presentation and workup, surgical anatomy and approach to resection or radiosurgical treatment, as well as the surgical outcomes and complications are reviewed in detail. In order to find studies examining the diagnosis and treatment of FM lesions, we performed a literature search of all papers (English) published from 1978 to 2009 using Medline. Medline search terms included the following keywords and phrases: foramen magnum, tumor, meningioma, surgical approach, expanded or extended endoscopic endonasal approach, and stereotactic radiosurgery. Because of the rare nature of these lesions, we included in our results any study that presented more than 5 patients with FM lesions. When studies reported cases included in previous reports, we only included the most recent study. For studies reported prior to 1978, we have used Yasargil's report  as the definitive summary of such cases. The clinical presentation of patients with FM lesions varies greatly and can mimic many other neurological disorders. Indeed, prior to the advent of advanced imaging technologies, patients with FM tumors were frequently misdiagnosed with a variety of disorders including multiple sclerosis, cervical spondylosis, and amyotrophic lateral sclerosis because of the uncommon symptoms caused by the anterior location of the lesion. 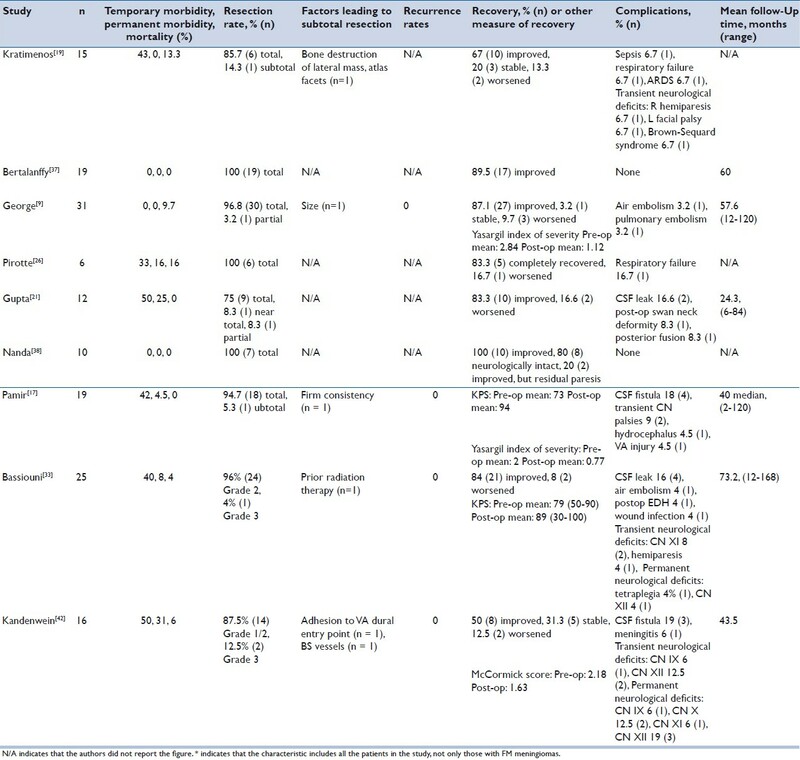 , [Table 1] shows the clinical characteristics of all major studies reporting patients presenting with lesions in the FM region (n = 1,010). Examining the literature that reports on such patients allows one to identify some obvious trends. Females are more likely to be afflicted with an FM tumor than males by an approximate ratio of 1.8:1, mainly due to the known propensity for meningiomas to occur more frequently in women. Patients were an average 46.3 years of age and ranged from as young as 10 to as old as 85. They experienced symptoms for an average of 26.5 months and most frequently complained of suboccipital headaches and/or neck pain (54.5%), followed by symptoms of motor weakness (47.6%) and gait disturbance (18.3%). In addition, about 1/3 of patients experience sensory deficits such as limb numbness, parasthesias and dysesthesias. Lower cranial nerve deficits are common and produce symptoms such as swallowing difficulty (10.3%). Signs on physical examination follow from the patients' symptoms and most frequently include upper motor neuron signs (26%) such as hyperreflexia and plantar extensor response or objective signs of weakness such as hemiparesis/plegia (10.1%) and quadriparesis/plegia (14.4%). They also may include lower cranial nerve palsies, sensory loss, and less commonly, ataxia or cerebellar signs on exam. Computed tomography (CT) and magnetic resonance imaging (MRI) revolutionized the care of patients with FM tumors as it allowed not only for correct diagnosis but also for detailed anatomical mapping of the tumor. Typically, gadolinium-enhanced T1 MRI images are used to identify the tumor location, its dural attachment, and any neural or vascular structures that may be encased within the tumor, although more sophisticated techniques such as three dimensional reconstruction are occasionally used to modify surgical approach if necessary. Magnetic resonance angiography (MRA) can also be used to identify vertebral artery (VA) involvement or displacement, VA dominance, and any collateral blood supply in the region. Pre-operative angiography is generally limited to cases in which the tumor receives its main blood supply from a meningeal VA branch and embolization is considered. Bone windows on CT are used to identify tumor calcifications, and bony erosion from extradural tumor extension . The far-lateral approach is essentially a lateral extension of the posterior midline or retrosigmoid approach that was initially used for anterior or anterolateral FM tumors. This approach is intended to facilitate visualization of and access to the anterior portion of the FM. Originally described by Heros  for VA aneurysms, it was modified for the removal of anterior FM benign tumors by George et al. and has undergone subsequent modifications in the intervening years. The current approach has been discussed in great detail previously, , but will be summarized below to illustrate both relevant regional anatomy and the approach itself. The patient can be positioned in either the sitting, prone, lateral or supine positions. Some authors note the importance of keeping the patient's head in any degree of flexion so as to avoid further narrowing the space between the neuraxis and anterior rim of the FM. , There are two commonly used variations for skin incision. The first is a C-shaped incision starting 2 finger breaths above the pinna and extending down well below the mastoid. The other is a more traditional "hockey-stick" midline incision extending from approximately the fourth cervical vertebra to the occipital protuberance and then extending laterally towards the mastoid process on the affected side. After detaching the sternocleidomastoid from its mastoid and lateral occipital attachments, the rest of the posterior muscles are divided close to their occipital attachments and reflected laterally. This exposes the occipital bone, C1 lamina and posterior arch, and, if necessary, the C2 lamina. The VA courses within a periosteal sheath along a groove in the posterior arch of C1. Within this periosteal sheath exists a surrounding venous plexus. Gaining control of the VA so as to better visualize the anterior FM is essential. Methodological differences exist in the literature on this point. Most authors report coagulation of the venous plexus that surrounds the VA. , However, George, et al. emphasize the importance of exposing the VA and its venous plexus by dissecting in the subperiosteal plane of the posterior arch of C1 from medial to lateral and inferior to superior. In this way, the VA and venous plexus are naturally protected from injury by the periosteal sheath and unnecessary bleeding from the venous plexus is avoided. , In addition, this obviates the concern that aberrant vessels coming off of this portion of the VA such as an extradural posterior inferior cerebellar artery (PICA) will be coagulated and occluded. After passing along the lateral part of the posterior arch of C1, the VA courses through the lower border of the atlanto-occipital membrane which, in up to 52% of cases,  can ossify and transform the groove of the posterior arch into a bony canal. This can make the exposure of the horizontal portion of the VA more difficult. Once exposed, the VA is displaced superiorly to show the lateral mass of the Atlas More Details. Care must be taken to protect the lower cranial nerves while removing the tumor. George et al. originally described an approach based on the location of the FM meningioma relative to the position of the VA.  For example, most tumors are located below the VA, therefore pushing the lower cranial nerves superiorly and can be reliably located when resecting the superior border of the tumor. Tumors located above the VA or above and below the VA, however, displace the lower cranial nerves in an unpredictable manner and the position of the lower cranial nerves cannot be anticipated. In this case, the cranial nerve rootlets must be identified and followed along their course towards the meningioma. As the tumor is progressively debulked using either an ultrasound aspirator or CO 2 laser, the rootlets can be mobilized. Finally, a watertight dural closure is required to prevent a postoperative CSF leakage, although some claim that this is not possible around the VA. If necessary, a dural patch using the suboccipital aponeurosis can achieve closure sufficient to prevent CSF leakage. Although endoscopic approaches have traditionally been adopted because of their minimally invasive nature, this approach involves significant drilling and bony removal in the sphenoid sinus and could be considered similarly "invasive" as open approaches to this region. The main theoretical benefit to this approach, then, could be more appropriately viewed as avoiding the brain retraction used in open approaches, as has been noted in reviews of this technique. On the other hand, the major complication associated with an endoscopic approach is CSF leakage, a problem which can be avoided with scrupulous attention to reconstructive technique. Regardless, this approach will undoubtedly undergo further sophistication and represents a significant improvement in approaches to the FM. Sterotactic radiosurgery (SRS) has become a viable alternative for arresting growth of FM tumors. ,, In general, the treatment isodose and fractionation schedule are based on the size, location and projected risk to surrounding structures. Mean isodoses have been prescribed in the range of 10-20 Gy with maximal doses ranging from 20-35 Gy for lesions 0.1-18.5 ccs in volume. , In particular, frameless LINAC-based systems offer both the tangible benefit of the ability to treat lesions below C1 and the theoretical benefit to nearby structures of the ability to fractionate dosing. [Table 2] demonstrates the results seen in all studies reporting use of the far lateral approach for FM lesions. One hundred and fifty-three cases using the far lateral approach have been reported since 1993. Surgical morbidity and mortality is often quite good in these series with, on average, 5.2% of cases resulting in death (8 in total), ranging from 0-13%. Permanent morbidities were seen in 7.8% of all cases (12 total) and ranged from 0-31%. These included lower cranial nerve deficits, paralysis, and infarcts resulting from VA injury. As would be expected, temporary morbidities are seen more frequently (24.8%) with typical complications including transient lower CN palsies, transient hemiparesis, and CSF leaks. The primary alternative approach currently in use is the extreme lateral approach. Salas et al. have published the largest series to date using this approach and advocate variations of its use depending on the type of lesion present. In total, 161 cases of a version of the extreme lateral approach to treat an FM lesion have been reported since Sen and Sekhar's original report in 1990 [Table 3]. Mortality in these cases was 5.6%, comparable to the 5.3% seen using the far lateral approach. Morbidity is reported in 151 of these cases resulting in 41.7% temporary morbidity and a 14.6% permanent morbidity rate. This compares to a 21.8% temporary morbidity and 7.5% permanent morbidity rate seen using the far lateral approach. Given the small number of cases, no conclusions can be drawn regarding the morbidity and mortality rates of these approaches. 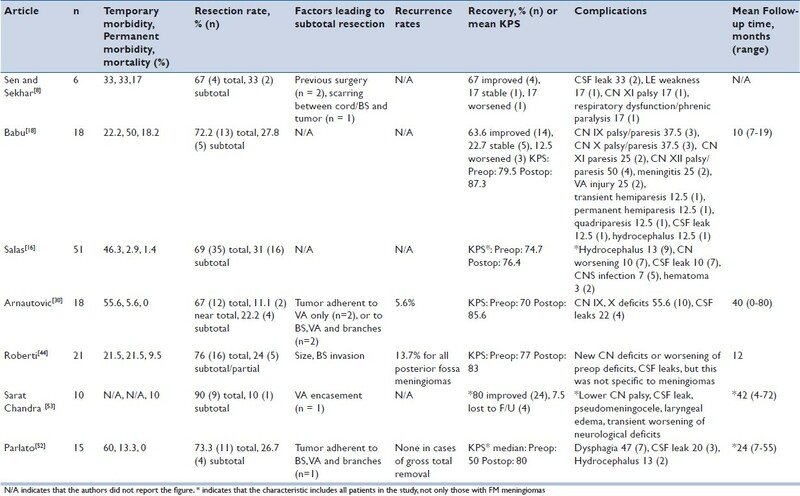 Three major studies comprise much of the literature on FM tumor resection prior to the introduction of laterally extended approaches. Yasargil published a review of 114 cases reported prior to 1976,  Meyer reported 102 total FM tumors seen at the Mayo Clinic from 1924 to 1982,  and George reported 230 FM tumors in 1993  for a total of 446 cases. Smaller case series occurring after these studies include Guidetti and Spallone's report of their experience with 18 cases of FM lesions,  Akalan's experience with 16 FM tumors,  and Goel's more modern report of 17 FM lesions. Strictly posterior approaches were used in all of these studies. It has been reported many times that the posterior midline approach used in these studies resulted in higher morbidity and mortality because of lateral brainstem displacement when removing anteriorly located tumors. ,, Thus, lateral approaches were developed in order to provide an easier and more natural working space for the surgeon to remove lesions, potentially resulting in better patient outcomes. The data from these studies show this to be the case [Table 2] and [Table 4]. Total mortality is decreased when comparing the far lateral or extreme lateral approaches to earlier, posterior approaches. In these studies, posterior approaches yielded a mortality of 10.5% as compared to 5.2 or 5.3% using the far lateral or extreme lateral approaches, respectively. Because these earlier studies tended to focus on clinical rather than surgical data, morbidities were rarely reported. Therefore, it is difficult to compare approaches in this regard. Given that much of the data on this approach comes from studies performed as early as the 1920s, we cannot exclude the possibility that much of this improvement in mortality may be due to any of a myriad of factors related to modern medicine including improved microneurosurgical techniques, anesthesia and perioperative care. Resection rates using the far lateral approach are quite good, although authors have used varying definitions for degree of resection. Some authors report resection rate using the Simpson grading scale, while others merely report "total" or "subtotal" resections. Most authors define "total" resections as Simpson grades 1 and 2, "subtotal" resections as Simpsons grade 3, and "partial" resections as grade 4. Using this definition for all studies that report FM tumor resection rates (n = 149), we see that the far lateral approach achieved gross total resection in 93.2% of all cases, subtotal resection in 5.4%, and partial resection in 1.3% of all cases. For the extreme lateral approach, we found that gross total resection rates were 74.7%, and subtotal resection rates were 25.3%. While resection rates were rarely reported for most of the older studies using the posterior midline approach, the French Cooperative Study (n = 103) did report their results, showing 77.7% total, 15.5% subtotal and 6.8% partial resection rates (as defined above). Factors leading to subtotal removal were similar for all approaches with firm consistency, neovascularity, adherence to surrounding structures, large overall size, and prior radiation therapy being the most common causes of subtotal removal. Given the high degree of variability and paucity of data, it is difficult to draw conclusions regarding resection rates. There may be, however, a theoretical benefit to greater exposure to overcome the inherent surgical limitations related to individual tumor characteristics leading to subtotal removal such as those mentioned above. Comparing postoperative recovery is equally difficult given the many different definitions of clinical recovery used. For far lateral approach studies that report individual patient data, (n = 134), we see that 80.6% of patients improved, 6.7% of patients remained stable, and 9% of patients worsened with 3.7% of patients unaccounted for. Authors using the extreme lateral approach have tended to report their cases using Karnofsky performance scores (KPS) rather than reporting individual data. Comparing mean KPS for the reported cases of each approach allows us to compare 44 patients using the far lateral approach , and 47 patients using the extreme lateral approach. ,, Mean pre-operative KPS in the far lateral cases was 76.4 and improved to 91.2, while KPS improved from 75.3 to 84.5 in cases using the extreme lateral approach, showing that both approaches lead to an improvement in postoperative performance status. Given the small number of patients and the inherent bias in including only those studies that reported KPS, any difference in outcome between the two methods should probably be ignored. Finally, for posterior midline approaches in all studies that reported data for FM lesions (n = 246), 72% of patients improved or had good results, 6.9% of patients were unchanged or had fair results, and 17.5% worsened or had poor results compared to 80.6%, 6.7% and 9%, respectively in the far lateral group. Again, it seems likely that the more modern approaches offer significant benefit in terms of postoperative recovery but comparison is difficult given the different measures of recovery and the improvements in peri-operative care mentioned earlier would certainly impact postoperative recovery status as well. FM tumor recurrence rates have been variably reported throughout the history of these studies. Of the far lateral approach studies that do mention tumor recurrence (n = 91), none have been reported. Alternatively, recurrence rates have been reported in various ways in the extreme lateral approach literature [Table 3] with rates of 5.6% for FM meningiomas, 13.7% for all posterior fossa meningiomas, and 0% for only gross total removal of FM meningiomas all being reported. Using the posterior midline approach, Meyer reported that 5% of patients operated on for a FM tumor died due to recurrence in the following three years. The data on recurrence rates is too sporadic to be useful. Because tumor recurrence highly depends on the extent of tumor removal, however, it is worthwhile to note that common reasons for subtotal tumor removal in studies using lateral approaches were never related to lack of exposure, but rather adherence to surrounding structures, size of tumor, and prior radiation therapy or surgery. Without individual data from studies using the posterior midline approach, we cannot know whether a lack of exposure contributed to subtotal removal and tumor recurrence. While there are many anatomical studies detailing the possibility of using this approach to remove anterior FM tumors, we did not find any study specifically addressing this issue. Most authors advocate this approach for small to medium-sized midline lesions without significant neurovascular involvement and have used it to remove suprasellar craniopharyngiomas, anterior cranial base meningiomas, or clival chordomas, among other types of lesions. ,,,,, This approach is exciting because it allows for direct access to anterior FM lesions without brainstem manipulation, however, future studies specifically examining the approach to FM lesions will determine whether this approach will be plagued by the same problems as its transoral and transcervical predecessors. Comparison with surgical treatment is difficult given the lack of data, but morbidity directly resulting from radiosurgery is at least comparable, if not better than that resulting from surgery. Both symptomatic improvement after treatment and mortality are probably inferior to that seen with definitive surgical management, an unsurprising result given that radiosurgery is not intended to cure patients of their disease. Thus overall, SRS seems to have minimal morbidity associated with treatment and presents a good, noninvasive alternative to surgical treatment for patients in whom operative management is inappropriate or who refuse surgical resection. 1. Hallopeau H. Note sur deux faits de tumeur de mesocephale. Gaz Med (Paris) 1874;3:2. 2. Frazier CH, Spiller WG. An analysis of fourteen consecutive cases of spinal cord tumor. Arch Neurol Psychiatr (Chicago) 1922;8:455-501. 3. Yasargil MG, Curcic M. Meningiomas of basal posterior cranial fossa. In: Krahenbuhl U editor. Advances and Technical Standards in Neurosurgery. Vienna: Springer-Verlag; 1980. p. 3-115. 4. Meyer FB, Ebersold MJ, Reese DF. Benign tumors of the foramen magnum. J Neurosurg 1984;61:136-42. 5. Mullan S, Naunton R, Hekmat-Panah J, Vailati G. The use of an anterior approach to ventrally placed tumors in the foramen magnum and vertebral column. J Neurosurg 1966;24:536-43. 6. Crockard HA, Sen CN. The transoral approach for the management of intradural lesions at the craniovertebral junction: review of 7 cases. Neurosurgery 1991;28:88-97. 7. Heros RC. Lateral suboccipital approach for vertebral and vertebrobasilar artery lesions. J Neurosurg 1986;64:559-62. 8. Sen CN, Sekhar LN. An extreme lateral approach to intradural lesions of the cervical spine and foramen magnum. Neurosurgery 1990;27:197-204. 9. Goel A, Desai K, Muzumdar D. Surgery on anterior foramen magnum meningiomas using a conventional posterior suboccipital approach: a report on an experience with 17 cases. Neurosurgery 2001;49:102-6..
10. Elsberg CA, Strauss I. Tumors of the spinal cord which project into the posterior cranial fossa: Report of a case in which a growth was removed from the ventral and lateral aspects of the medulla oblongata and upper cervical cord. Arch Neurol Psychiatry 1929;21:254-60. 11. Love JG, Thelen EP, Dodge HW Jr. Tumors of the foramen magnum. J Int Coll Surg 1954;22:1-17. 12. Guidetti B, Spallone A. Benign extramedullary tumors of the foramen magnum. Surg Neurol 1980;13:9-17. 13. Dodge HW Jr, Gottlieb CM, Love JG.. Benign tumors at the foramen magnum; surgical considerations. J Neurosurg 1956;13:603-17. 14. Yasuoka S, Okazaki H, Daube JR, MacCarty CS. Foramen magnum tumors. Analysis of 57 cases of benign extramedullary tumors. J Neurosurg 1978;49:828-38. 15. Gupta SK, Sharma BS, Khosla VK, Mathuria SN, Pathak A, Tewari MK. Far lateral approach for foramen magnum lesions. Neurol Med Chir (Tokyo) 2000;40:48-52. 16. Salas E, Sekhar LN, Ziyal IM, Caputy AJ, Wright DC. Variations of the extreme-lateral craniocervical approach: anatomical study and clinical analysis of 69 patients. J Neurosurg 1999;90:206-19. 17. Nanda A, Vincent DA, Vannemreddy PS, Baskaya MK, Chanda A. Far-lateral approach to intradural lesions of the foramen magnum without resection of the occipital condyle. J Neurosurg 2002;96:302-9. 18. Babu RP, Sekhar LN, Wright DC. Extreme lateral transcondylar approach: technical improvements and lessons learned. J Neurosurg 1994;81:49-59. 19. Howe JR, Taren JA. Foramen magnum tumors. Pitfalls in diagnosis. JAMA 1973;225:1061-6. 20. Sawaya RA. Foramen magnum meningioma presenting as amyotrophic lateral sclerosis. Neurosurg Rev 1998;21:277-80. 21. Pamir MN, Kiliç T, Ozduman K, Türe U. Experience of a single institution treating foramen magnum meningiomas. J Clin Neurosci 2004;11:863-7. 22. George B, Dematons C, Cophignon J. Lateral approach to the anterior portion of the foramen magnum. Application to surgical removal of 14 benign tumors: technical note. Surg Neurol 1988;29:484-90. 23. Rhoton AL Jr. The far-lateral approach and its transcondylar, supracondylar, and paracondylar extensions. Neurosurgery 2000;47:S195-209. 24. Bruneau M, George B. Foramen magnum meningiomas: detailed surgical approaches and technical aspects at Lariboisière Hospital and review of the literature. Neurosurg Rev. 2008;31:19-32. 25. George B, Lot G. Anterolateral and posterolateral approaches to the foramen magnum: technical description and experience from 97 cases. Skull Base Surg 1995;5:9-19. 26. George B, Lot G, Boissonnet H. Meningioma of the foramen magnum: a series of 40 cases. Surg Neurol 1997;47:371-9. 27. Margalit NS, Lesser JB, Singer M, Sen C. Lateral approach to anterolateral tumors at the foramen magnum: factors determining surgical procedure. Neurosurgery 2005;56:324-36. 28. de Oliveira E, Rhoton AL Jr, Peace D. Microsurgical anatomy of the region of the foramen magnum. Surg Neurol 1985;24:293-352. 29. Samii M, Klekamp J, Carvalho G. Surgical results for meningiomas of the craniocervical junction. Neurosurgery 1996;39:1086-94. 30. Arnautoviæ KI, Al-Mefty O, Husain M. Ventral foramen magnum meninigiomas. J Neurosurg 2000;92:71-80. 31. Pirotte B, David P, Noterman J, Brotchi J. Lower clivus and foramen magnum anterolateral meningiomas: surgical strategy. Neurol Res 1998;20:577-84. 32. Wen HT, Rhoton AL Jr, Katsuta T, de Oliveira E. Microsurgical anatomy of the transcondylar, supracondylar, and paracondylar extensions of the far-lateral approach. J Neurosurg 1997;87:555-85. 33. Kratimenos GP, Crockard HA. The far lateral approach for ventrally placed foramen magnum and upper cervical spine tumours. Br J Neurosurg 1993;7:129-40. 34. Kassam A, Snyderman CH, Mintz A, Gardner P, Carrau RL. Expanded endonasal approach: the rostrocaudal axis. Part II. Posterior clinoids to the foramen magnum. Neurosurg Focus 2005;19:E4. 35. Kassam A, Snyderman CH, Mintz A, Gardner P, Carrau RL. Expanded endonasal approach: the rostrocaudal axis. Part I. Crista galli to the sella turcica. Neurosurg Focus 2005;19:E3. 36. Dehdashti AR, Ganna A, Witterick I, Gentili F. Expanded endoscopic endonasal approach for anterior cranial base and suprasellar lesions: indications and limitations. Neurosurgery 2009;64:677-87. 37. Cheshier SH, Hanft SJ, Adler JR, Chang SD. CyberKnife radiosurgery for lesions of the foramen magnum. Technol Cancer Res Treat 2007;6:329-36. 38. Nicolato A, Foroni R, Pellegrino M, Ferraresi P, Alessandrini F, Gerosa M, et al. Gamma knife radiosurgery in meningiomas of the posterior fossa. Experience with 62 treated lesions. Minim Invasive Neurosurg 2001;44:211-7. 39. Muthukumar N, Kondziolka D, Lunsford LD, Flickinger JC. Stereotactic radiosurgery for anterior foramen magnum meningiomas. Surg Neurol 1999;51:268-73. 40. George B, Lot G, Velut S, Gelbert F, Mourier KL. French language Society of Neurosurgery. 44th Annual Congress. Brussels, 8-12 June 1993. Tumors of the foramen magnum. Neurochirurgie 1993;39:1-89. 41. Akalan N, Seçkin H, Kiliç C, Ozgen T. Benign extramedullary tumors in the foramen magnum region. Clin Neurol Neurosurg 1994;96:284-9. 42. Bertalanffy H, Seeger W. The dorsolateral, suboccipital, transcondylar approach to the lower clivus and anterior portion of the craniocervical junction. Neurosurgery 1991;29:7. 43. Bassiouni H, Ntoukas V, Asgari S, Sandalcioglu EI, Stolke D, Seifert V. Foramen magnum meningiomas: clinical outcome after microsurgical resection via a posterolateral suboccipital retrocondylar approach. Neurosurgery 2006;59:1177-87. 44. Roberti F, Sekhar LN, Kalavakonda C, Wright DC. Posterior fossa meningiomas: surgical experience in 161 cases. Surg Neurol 2001;56:8-20. 45. De Divitiis E, Cappabianca P, Cavallo LM, Esposito F, de Divitiis O, Messina A. Extended endoscopic transsphenoidal approach for extrasellar craniopharyngiomas. Neurosurgery 2007;61:219-27. 46. De Divitiis E, Cavallo LM, Cappabianca P, Esposito F. Extended endoscopic endonasal transsphenoidal approach for the removal of suprasellar tumors: Part 2. Neurosurgery 2007;60:46-58. 47. Couldwell WT, Weiss MH, Rabb C, Liu JK, Apfelbaum RI, Fukushima T. Variations on the standard transsphenoidal approach to the sellar region, with emphasis on the extended approaches and parasellar approaches: surgical experience in 105 cases. Neurosurgery 2004;55:539-47. 48. de Divitiis E, Esposito F, Cappabianca P, Cavallo LM, de Divitiis O, Esposito I. Endoscopic transnasal resection of anterior cranial fossa meningiomas. Neurosurg Focus 2008;25:E8. 49. Carrabba G, Dehdashti AR, Gentili F. Surgery for clival lesions: open resection versus the expanded endoscopic endonasal approach. Neurosurg Focus 2008;25:E7. 50. Bertalanffy H, Gilsbach JM, Mayfrank L, Klein HM, Kawase T, Seeger W. Microsurgical management of ventral and ventrolateral foramen magnum meningiomas. Acta Neurochir Suppl 1996;65:82-5. 51. Marin Sanabria EA, Ehara K, Tamaki N. Surgical experience with skull base approaches for foramen magnum meningioma. Neurol Med Chir (Tokyo) 2002;42:472-8. 52. Parlato C, Tessitore E, Schonauer C, Moraci A. Management of benign craniovertebral junction tumors. Acta Neurochir (Wien) 2003;145:31-6. 53. Sarat Chandra P, Jaiswal AK, Mehta VS. Foramen magnum tumors: a series of 30 cases. 55. Boulton MR, Cusimano MD. Foramen magnum meningiomas: concepts, classifications, and nuances. Neurosurg Focus 2003;14:e10. 56. Kandenwein JA, Richter HP, Antoniadis G. Foramen magnum meningiomas--experience with the posterior suboccipital approach. Br J Neurosurg 2009;23:33-9.